It was lunchtime. I walked around the corner to my local noodle soup shop. They don’t just do plain old noodle soup, they have my favourite, tom yam, or in this case creamy tom yam with pork. Delicious. Now I’ve been going to this particular noodle soup shop for a while now, and I know that I like the food that comes out of there. There is just the right amount of noodle:meat:veg:sauce ratio, you always get those yummy crispy pork crackling bits thrown on top and most importantly it tastes good. Dai ka! …I can! I replied with gusto, not thinking about the potential repercussions that this may have. I eat this noodle soup at least once a week. What’s the worst that could happen? Unfortunately for me, when the girl behind the counter heard my eager reply, she took it as a personal challenge. Yes, I can eat spicy, but I am still a foreigner. I’m wired up differently inside, doesn’t she know that? The noodle soup was prepared and handed over to me in an assortment plastic bags (luckily for me this was a take away lunch so I wouldn’t have an audience for what was going to happen next). I got a glimpse of the soup as it was put into a carrier bag and I could see that it had split, and a bright red layer of oil sat atop of my creamy tom yum soup. It looked fiery as hell and definitely far spicier and less creamy than usual. I walked home, cursing myself for getting myself into this situation. 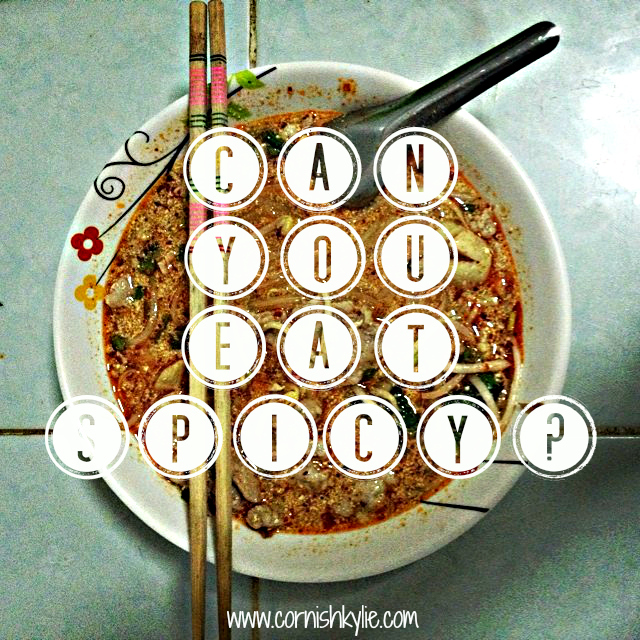 Yes, I can eat spicy, but spicy for me. Not spicy on the Thai scale. I wish I could say that in Thai. Not that I would ever tell a vendor that I couldn’t eat spicy, especially when ordering a typically spicy dish – my pride couldn’t take the hit. It would be like ordering a vindaloo and asking for it not to be spicy. It just doesn’t work that way. I got home and assembled my lunch. Noodles, veg and pork balls slipped out of the first bag and into my bowl. I fished out the bonus pieces of offal and gave them to one of the cats. I took the second bag and observed how the sauce had indeed curdled from the pure hellish power of the amount of chili that could be found within. I gave it a shake and poured it atop my noodles. The hot, spicy steam rose from the bag and hit my eyes. I now understand why mustard gas was used in warfare. If how my eyes felt was anything to go by, my throat was about to go through it’s paces. A third bag containing chili powder was left untouched. Did she think I was some chili eating super woman? There was only one thing for it. I’m not going to let a bowl of what is usually my favourite noodle soup go to waste. Taking care not to take too much sauce, I took a mouthful. The back of my throat seemed to close over in what can only be a survival instinct to save my insides from what was headed down there. I swallowed, and coughed, mostly so I could gulp at the air around me in search of anything that didn’t contain this flaming concoction. The first bite is always the spiciest. I reassured myself. I braced myself and went in for a second go. Keep going, your mouth will get used to it. Yes, my mouth was getting used to it, because all nerve endings were being obliterated by the burn of birdseye chili and tom yam paste. I persevered. I fished out pieces of green vegetable and let the sauce drip off. I took noodles and blew on them to try and ease the pain. Nothing worked. I had to admit defeat. By this point my hunger was gone and I wasn’t sure if I even had a stomach remaining. All I could feel was spice pouring from my every orifice. My stomach burned, my throat ached and my eyes watered. I was covered in a thin sheen of chili sweat and my lips felt like they had been pricked with a thousand tiny needles dipped in chili-laced acid. It’s at times like these that I wish I could drink milk without feeling sick, but I can’t, so I made do with a bottle of cold water (yes, I am aware that this wouldn’t actually have helped me but needs must) and I waited for my spice ride from hell to come to an end. In time, the spiciness subsided, but to this day whenever a food seller asks me that question I try my best to let them know that I can eat a little spicy, but not too spicy. If in doubt, I politely shake my head and let them think that I can’t stomach it at all. Anything to avoid getting myself into this situation another time. Never again. Once again my favourite source for time wasting and cat videos has come up trumps with a little video to help you to while away 2 and a half minutes of your time. It will also give you a little insight into the day to day things that I have to go through as a picky eater living in Thailand. P.S. Curry puffs and sesame nuts rock – omnomnomnomnom. This video parody from China has been doing the rounds in response to all the food stereotypes we portray in our cooking shows about the great nation – rice, spring rolls and sweet & sour come to mind – and so they decided to have a dig at our most cherished and revered cooking ingredient, the humble potato. Do you have any foods from home that you miss? Or if you are still on home turf, is there one thing you can’t live without? An ode to Yum Gai Sap. 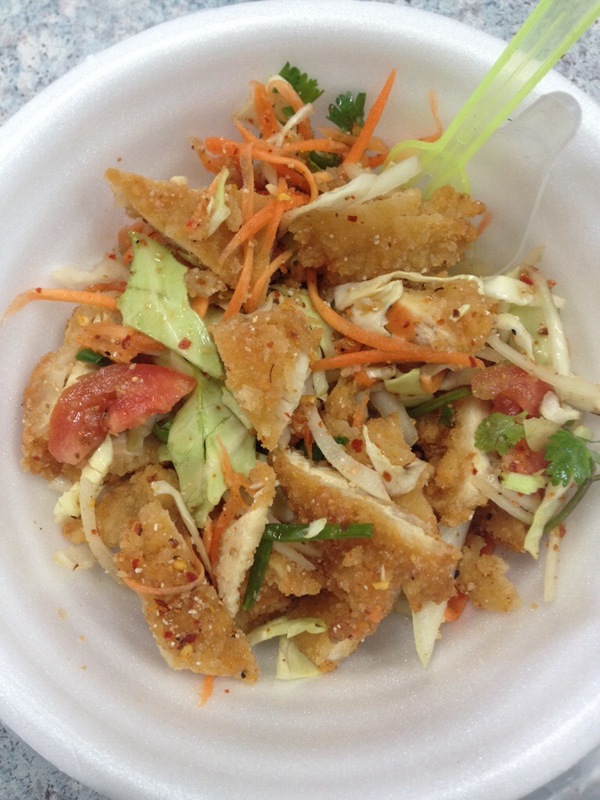 This is Yum Gai Sap, a fiery mix of breaded fried chicken (I never promised this would be healthy) mixed with raw shredded carrot, onion, tomato, cabbage and coriander (there’s your five a day right there, if mini Thai portions counted). This all sits in an effing spicy (that is the official culinary term) chilli/fish/lime sauce finished off with a dusting of toasted rice powder. I have lived off of this stuff. It is the food of Gods (or, hungry TEFL teachers with little time). And at only 30THB, which is 60p, it is super cheap. Some weeks I have eaten this four times in a five day period. I try to space it out with other food because it is effing spicy and often results in not only a spicy/oniony breath that doesn’t lend itself well to those close teacher-student moments but also a phenomenon that I and my fellow Yum Gai Sap addicts like to refer to as THE BELLY BURN. Ouchies. I think it’s the lack of rice that does it, there’s nothing there to soak up it’s effing spiciness. You can order it with rice but I STILL CAN’T EAT RICE FOR EVERY MEAL. My first mission upon moving to Phuket will be to locate my local Yum Gai Sap seller. It may be a difficult find as I only know of two places that sell it, both of which are a stones throw the school that I am about to leave. Oh, Yum Gai Sap, I will miss you. The belly burn not so much.